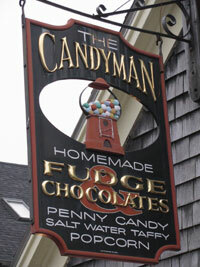 Bargain hunters and treasure seekers love the Kennebunks. There’s something for every shopper in our seaside community. If you like chic boutiques with the latest fashion, then Dock Square has just the sho ps for you. 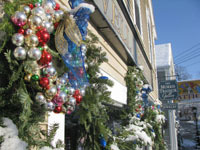 Boutiques and galleries are filled with beautiful works of art and unique handcrafted Maine gifts, jewelry, clothing and furniture. Minka, Compliments, Daytrip Society, Copper Candle, Candy Man, Coastal Jewelers, Dock Square Clothiers, Shoot The Moon, Julia’s Gifts, Beach Grass, Abacus, Maine-ly Drizzle, Benoits, Best of Everything, PJ’s Unique Boutique, Pink and Green Tangerine, Zen, Down East Wines, Make it Kpt, are just a few of the fantastic shops. Book stores and antique shops are filled with rare Maine treasures you won’t find elsewhere. You could easily spend the day browsing the shops along the waterfront in Kennebunkport, with lunch at a café, or happy hour. 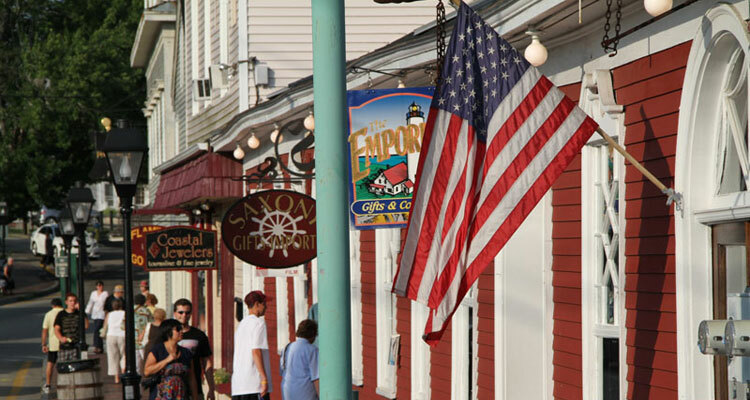 Downtown Kennebunk is a charming Maine town with a local market, ladies’ and men’s clothing stores and gift shops – Ramblers Way, Kennebunk Toy Company, Talbots and Restless Threads. Shoppers will often find farmers markets, festivals and craft shows in town. Just a short drive away are the Shops at Biddeford Crossing with famous name brand stores. 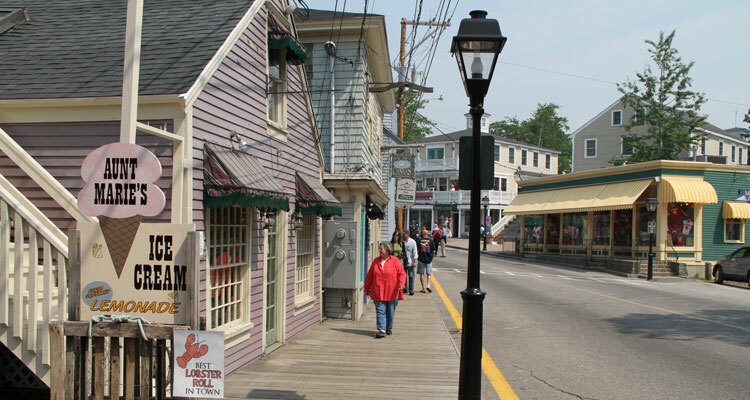 The Kennebunks are also conveniently located between Kittery Outlets, Portland’s Maine Mall, and Freeport where you will find more designer outlet shopping plus world famous L.L. Bean. Dock Square Shops- Kennebunkport’s best shops, boutiques and galleries: Abacus, Day Trip Society, Minka, Coastal Jewelers, Beach Grass, Julia’s, PJ’s, Carla’s, Dannahs, Candyman, Copper Candle, Compliments, Saxony, Make it KPT, Ireland on the Square, Scalawags, Digs Divots & Dogs, Down East Wines, and Best of Everything to name a few. Shops at Biddeford Crossing – Large Retail Center 15 minutes north of the Kennebunks in neighboring Biddeford. Anchored by Target, Market Basket, TJ Max, Kobe, Panera, Olympia Sports, Olive Garden, Longhorn Steakhouse, Chill’s, and more. Rt 111 Biddeford. Marden’s a Maine classic salvage and surplus store on Route 1. L.L. Bean – World famous and open 24 hours, 365 days per year. 1 hour north in Freeport. Freeport also offers over 100 outlet stores. 207-865-1212. Cabela’s – Scarborough, Maine – new Outdoor Sports Store just off the Maine Turnpike 30 minutes north. The Maine Mall – Over 135 stores including restaurants, theaters and more. 364 Maine Mall Road, So. Portland. 207-774-0303. The Old Port – Portland’s Historic District offers over 158 shops, 65 restaurants, 28 galleries, and numerous pubs. All located in a charming five block area lined with cobblestone streets on Portland’s historic waterfront. 400 Congress St., Portland. 207-772-6828. Stonewall Kitchen – It all started right in York Maine – home of Stonewalls flagship store. A feast for the eyes and the palate, welcoming you with New England hospitality. A friendly and knowledgeable staff will greet you, ready to offer creative recipes using Stonewall Kitchen products. Relax, leaf through one of the hundreds of cookbooks available, sample recipes and savor the experience.